Create & Download prayer timetable for many cities worldwide as Excel or PDF. Alhabib provides muslims across the internet with various web services and widgets. Here you can find greeting cards for various islamic events, islamic calendar and clock widgets that you can display on your blogs or desktop. Various other widgets with islamic styles and themes are also available to decorate your web's presence. Or how about printing your own free islamic wall calendar with references to important islamic events? Available for various islamic festivals: eids, ramadan, hajj and other themes. Select from many styles and start displaying hijri date on your site or blog. These clock widgets are styled with islamic theme & can serve as world clocks. Are you facing in the right qibla direction when praying? Find out with this little Google-Map utility. All the news, announcements, behind the scenes, and thoughts around Alhabib's website and services. From Asmaul Husna, countdown to customizable greeting widgets for your blog. Ever seen such pictures dubbed the evident or miracle of Allah? Just a little exercise on this topic. From a crack on the moon to a floating rock in Jerusalem. Things you should know on how you can have your favorite islamic widgets on your own desktop or blog. From Personas to wordpress flash widgets. 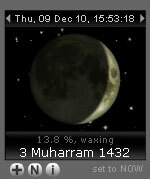 Display hijri date with current moon phase!